The far side looks *nothing* like the side that faces us. After 55 years, we may finally know why. Image credit: Gregory H. Revera, via Wikimedia Commons from http://en.wikipedia.org/wiki/File:FullMoon2010.jpg. If you’ve ever looked up at the brightest object in the night sky, you’ve probably noticed how different some parts of it appear to be from others. And if you’ve ever taken a look at it through a telescope, especially if it’s not in its full phase, you’ve very likely noticed some remarkable features on its surface. 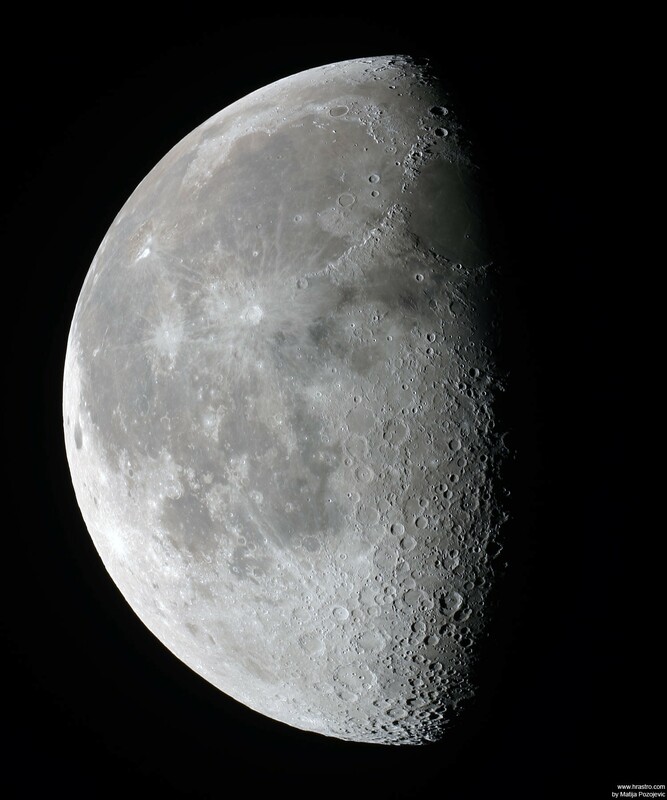 Image credit: Matija Pozojevic of http://www.hrastro.com/WaningGibbous_Moon/. That it has these dark areas known as maria (latin for “seas”), which have relatively few and mostly smaller craters in them. Mostly, these regions are notable for being a significantly different color than the majority of the Moon. Image credit: Wikimedia Commons user Tomruen, via http://en.wikipedia.org/wiki/File:Lunar_libration_with_phase_Oct_2007_450px.gif. In addition, because the Moon’s orbit is elliptical, moving faster when it’s closest to Earth and slower when it’s farthest away, the face of the Moon that’s visible changes ever-so-slightly, a phenomenon known as lunar libration. 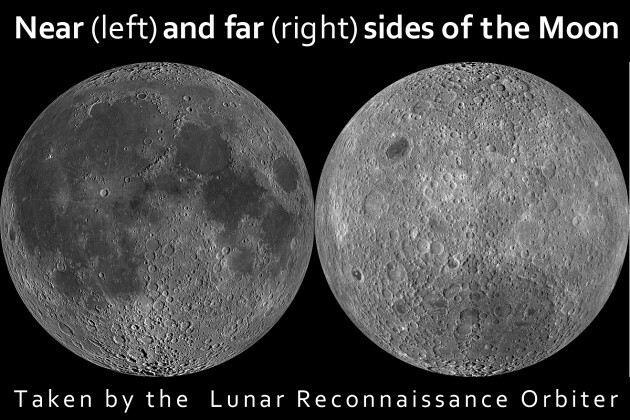 Even though this means, over the course of many months, we could see up to a total of 59% of the Moon, it wasn’t until 55 years ago, when the Soviet spacecraft Luna 3 swung around to the far side of the Moon, that we got our first pictures of the far side of the Moon. Although it wasn’t very impressive, many subsequent pictures have shown us what the side facing away from Earth actually looks like, and it came as quite a shock! Images (mosaic) credit: NASA / DoD / Clementine Spacecraft. One thing you’ll notice right away is the almost complete absence of the dark maria on the far side, and perhaps the second thing you’ll see is how much more prominently and thoroughly cratered the far side is. Although this was first discovered all the way back in 1959, it took a lot longer to come up with a reason for this mystery. You see, there’s an obvious explanation — that perhaps you even thought of yourself — but it turns out to be wrong. Image credit: ESA / P. Caril. You and I know that the Solar System is full of hazardous comets and asteroids, periodically plunging into the inner reaches of our star’s vicinity. When things go well for the inner worlds, these bodies produce spectacular displays like cometary tails and meteor showers. But when things go poorly, one of those large bodies smacks into a larger one, creating a catastrophic impact! The “obvious” explanation would be that when these massive space rocks head towards the Moon from the far side, there’s nothing at all getting in the way. 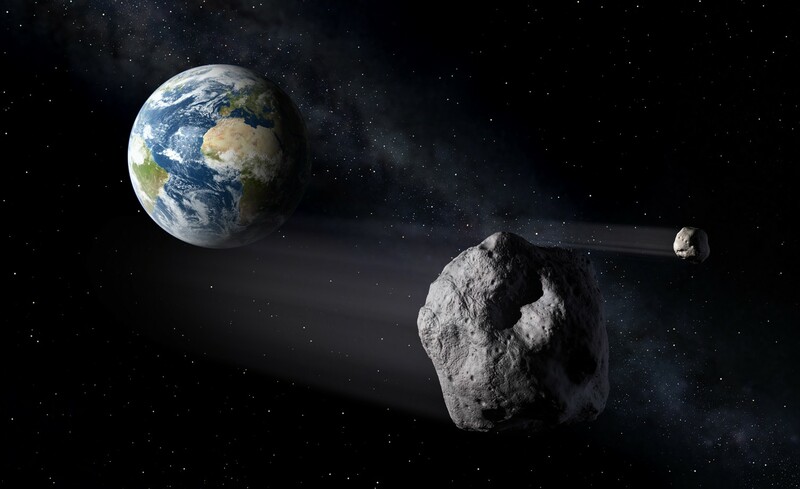 But when you approach the Moon from the near side, the Earth is in the way, and that it can either absorb those impacts or gravitationally deflect those potential impactors away from the Moon. Image credit: forum user Leofidus of https://forums.robertsspaceindustries.com/discussion/17470/scale-of-planets-and-stars, of the Earth and Moon to scale. It’s a nice attempt, but the fact that the Earth-Moon distance is some forty times larger than the diameter of the Earth means that the difference in the number of impacts on the near side of the Moon from the far side ought to be less than 1% when we run the numbers. The answer, it turns out, does have something to do with space collisions, but not like you’re thinking! 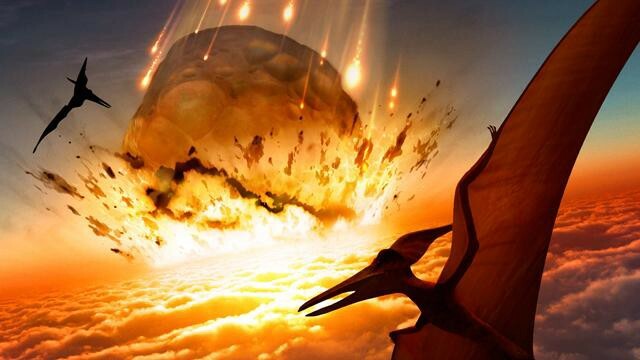 Image credit: Mark Garlick / Science Photo Library, via http://www.bbc.co.uk/science/earth/earth_timeline/mass_extinctions. You might think the asteroid that wiped out the dinosaurs was a big one, and I suppose I’m no one to argue. It was roughly 5-to-10 km across, or the size of a very large mountain. But that’s not the largest collision in Earth’s history, not by a long shot. We didn’t even realize this until we brought rocks back from the Moon, and discovered that they’re made of exactly the same stuff as Earth is made out of! This was a big surprise, because no other moon/planet companions in the Solar System — not Jupiter and its moons, not Mars and its Moons, not Saturn and its Moons — are like that. How did this come to be? Some 4.5 billion years ago, when the Solar System was still in its infancy, the Earth was mostly formed, and was around 90% of its present mass. But there was another very large, Mars-sized planetoid that was in an almost identical orbit to Earth’s. For tens of millions of years, these two objects unstably danced away from one another. And then, finally, they collided with one another! 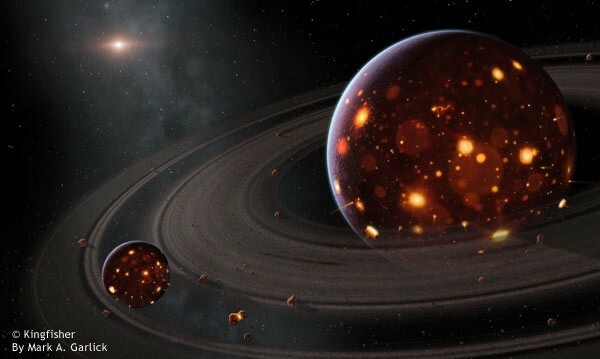 The vast majority of both proto-planets wound up forming the Earth, while a large amount of debris was kicked up into space. Over time, this debris coalesced gravitationally to form the Moon! As crazy as it sounded when it was proposed in the 1970s, this has come to be the accepted theory — verified by many observable phenomena that match the predictions — over the past 40 years. 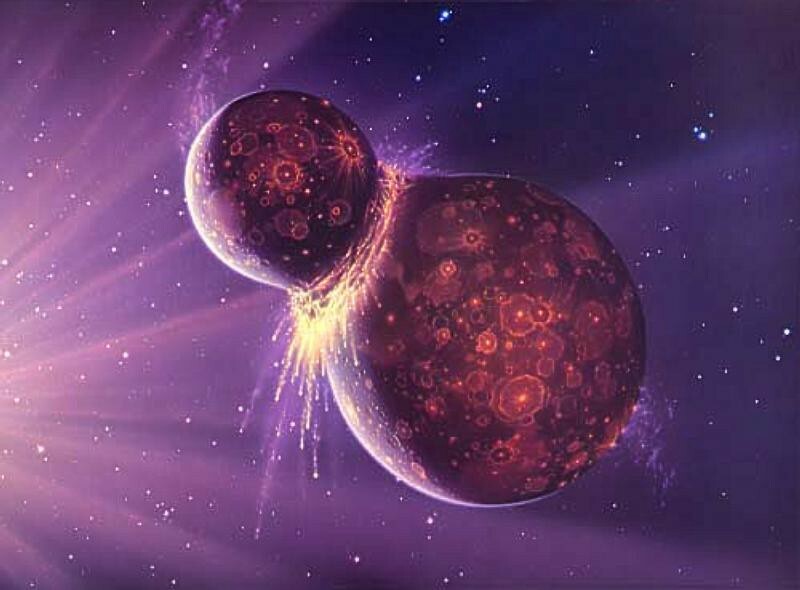 Now, this collision happened very early in the Solar System’s history, and the Earth was still very hot when it happened: around 2,700 Kelvin! The Moon might have been much closer, but was still tens of thousands of kilometers away. Even so, having that extra heat source close by — and having the Moon already be tidally locked (with one side always facing us) — meant that the near side of the Moon was going to be much hotter for a very long time than the far side would be! Image credit: copyright Kingfisher, art by Mark A. Garlick, retrieved from http://spaceart1.ning.com/photo/birth-of-the-moon. The maria that we see are evidence of lava flows, where molten rock flowed into the great basins. While the far side of the Moon cooled relatively quickly and formed a thick crust, the large temperature gradient caused by being in close proximity to Earth on the near side left huge amounts of the near side in the liquid state for longer, giving it far less time to have the effects of impacts leave features on the surface. Just like meteors striking the Earth’s oceans, the ones landing in the Moon’s ancient lava oceans didn’t leave scars! 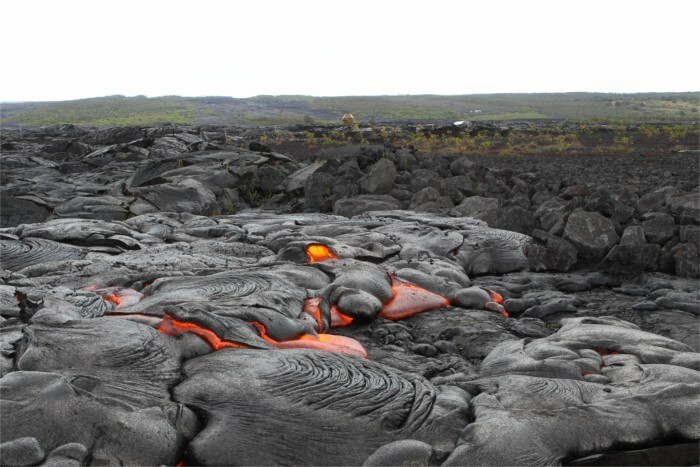 Image credit: Hawaiian lava flow by Leigh Hilbert Photography, via http://hawaiianlavadaily.blogspot.com/2010/11/surface-lava-flows-by-viewing-area.html. Impacts wouldn’t leave scars here, either. It was only last month that a study by Arpita Roy, Jason Wright and Steinn Sigurdsson appeared to have figured this all out and presented the necessary evidence to support it. They created a model of the early Earth-Moon system and showed that simply by having a hot Earth near enough to a tidally locked Moon — just by adding that one-sided heat source — it could create the crustal difference and the elemental, chemical difference between the two sides. Images credit: NASA / JPL-Caltech / LRO. And so, for the first time, we can confidently state not only how the Moon formed, but why the two sides are so different! We know that the Moon shines by reflecting the Sun’s light, but who would’ve imagined that it was the young Earth, glowing bright and hot in the Moon’s sky, that would make the two sides so different? That’s just part of the wonder and joy of science!